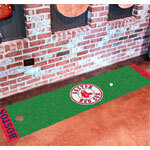 Large, realistic Boston Celtics putting green and runner. 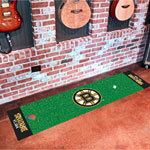 The putting surface is a fast 11 feet as measured by the Stimpmeter*). Chromojet-printed nylon surface with vinyl backing. Can also be used as a runner when not practicing. Comes with plastic target and flag. Officially licensed by the NBA. Chromojet-printed with official Boston Celtics team logo in true team colors. Size: 18" x 72".